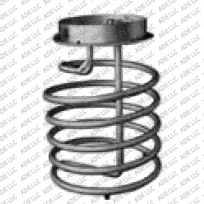 We have cooling coils in several sizes and configurations to fit several different needs. We have quick attach cooling coils that fit our 55 gallon and 100 gallon Backwoods Series Mash Tuns and Fermenters. These work great to cool your corn mash down from 212°F to 155°F for throwing malt, and then to cool your mash on down to 70°F for throwing yeast. Large fermentations can build up excessive amounts of heat. If your mash ferments at too high a temperature, off flavors are created that can decrease the value and drink ability of your spirits. These cooling coils work great for keeping your fermentations between 70°F and 80°F.